Flowers are integral to the cultural tapestry of Hawai’i. 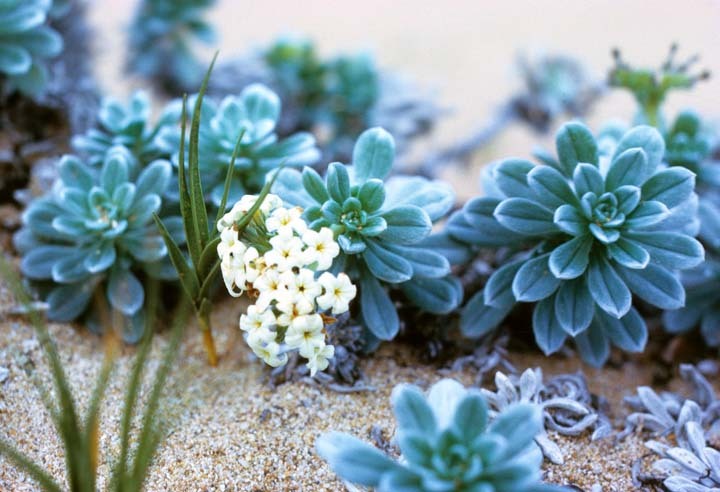 These are na pua o Maui Nui — the flowers of Kaho’olawe, Lanai, Maui, and Molokai. Hinahina (heliotropium anomalum) is the plant of Kaho’olawe. The leaves are somewhat succulent and often grow in rosettes towards the tips of the stems. The small, white, tubular flowers are sweetly fragrant. Don’t confuse hinahina with Spanish moss or Pele’s hair. In pageantry the Spanish moss is almost always substituted for the native hinahina to represent the island of Kaho’olawe, since it is easier to get Spanish moss than it is to get the native heliotrope. Lanai’s flower Kaunaoa (cuscutaceae) is not really a flower, but a rare yellow and orange air plant. 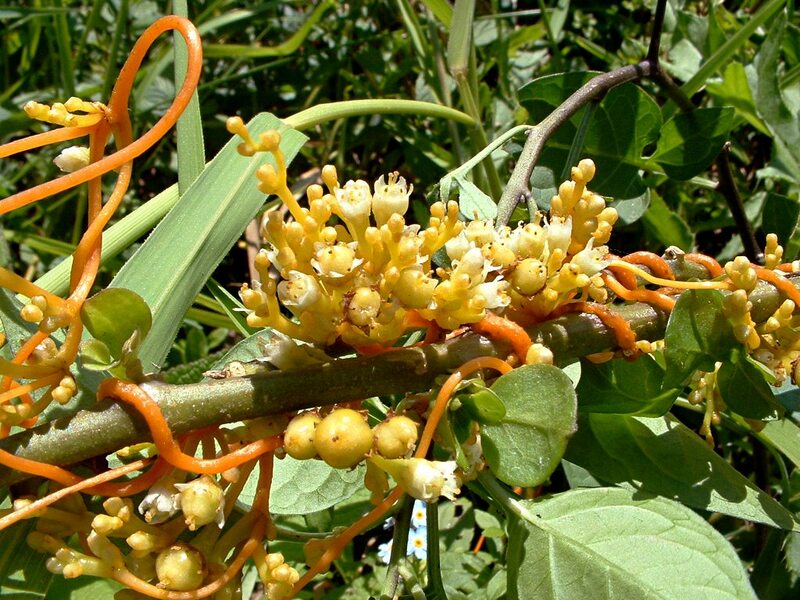 Lei makers take the thin, light orange strands of this vine and twist them together to form lei. Legend says that the goddess Pele fled to Lanai from her angry sister Namakaokahai, the goddess of the sea, and dropped her Kaunaoa lei at the beach, where golden vines started growing. 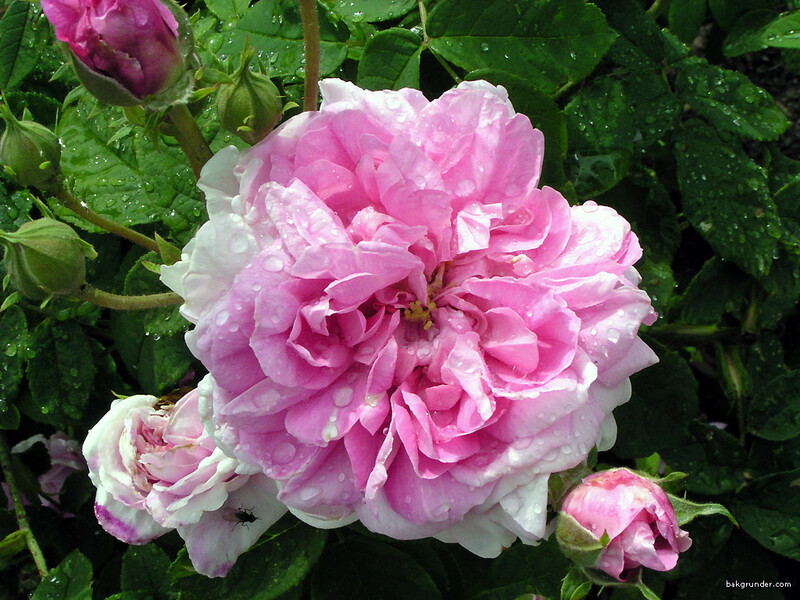 The pink Lokelani (rosa damascene) is the official flower of Maui. Native to Asia Minor it was brought to the New World by the Spanish and introduced to Hawai’i in the early 1800s. 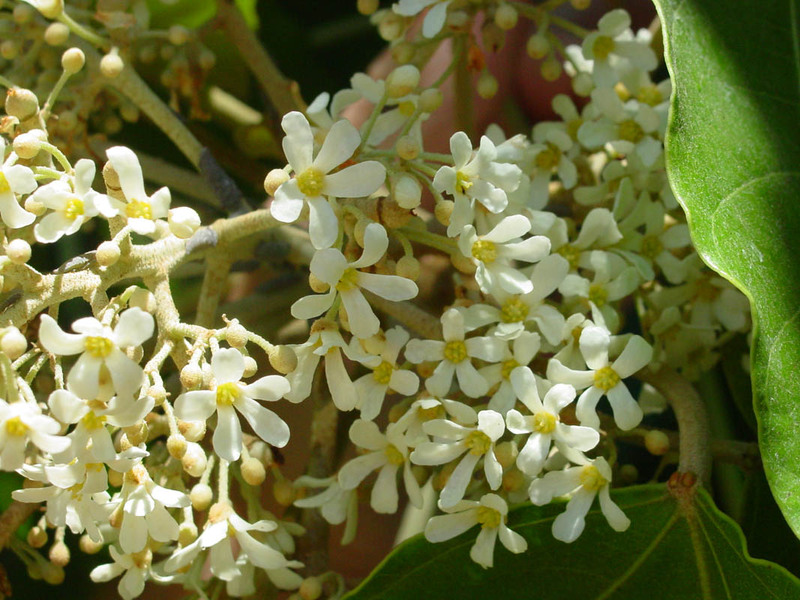 The Lokelani is prized by gardeners for its beauty and fragrance and is the only non-native plant to be recognized as the official flower of any of the Hawaiian islands. The white Kukui blossom (aleurites moluccana) is the flower of Molokai. It is the blossom of the very useful Kukui tree. The flowers, leaves and the nuts are often used in lei. The nuts are used for their oil, can be eaten, and contain a black dye that is used for tattooing. The wood of the Kukui tree was used for making canoes and the leaves were chewed to relieve sorrow. The Hawaiian Islands once issued their own currency and coinage under their own rulers. Hawai’i’s first modern government was established in the early 19th century, but it wasn’t until 1847 that they established a modern treasury and issued currency. Before this, Hawaiians relied on various plantation tokens and foreign coins. The economy was so small it was not difficult to trade in this manner. As the economy and population grew, it became more difficult to exchange disparate monies, so a new, local money was established. The dala or dollar was the currency of Hawaii between 1847 and 1898. It was equal to the US dollar and was divided into 100 keneta or cents. 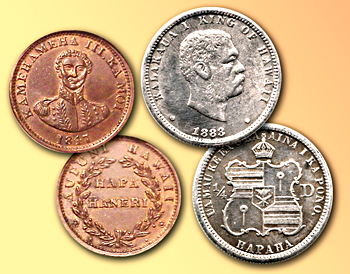 The 1847 Kamehameha penny was the first coin issued by the Hawaiian government. The penny was the smallest denomination with several coins in between paralelling the structure and value of the U.S. dollar of the time. They were minted in copper and produced in small numbers by a private U.S. mint — just enough for the small population of the islands. During his reign (1874-1891), King Kalakaua was committed to developing Hawai’i’s power in the South Pacific and bringing more income to his small nation. He needed new money to improve his country’s economy. The old coins were eliminated from circulation, and a new set of money was commissioned. The U.S. Mint (as it still does today for other countries) produced this new coinage for Hawaii, and in 1883 they came up with Hawaii’s four requested coins: 1 dollar, 1/2 dollar, 1/4 dollar, and 1/8 dollar. Larger denominations were also produced as paper currency, up to a $500 bill, in the allegorical style of most Western Hemisphere money of the time. In 1898, Hawai’i became a territory of the United States, and eventually the U.S. dollar supplanted their local currency. However, this wasn’t the end of special Hawaiian money. In January 1942, one month after Pearl Harbor was bombed, the U.S. government fearing enemy invasion announced that “New Money” was on its way. 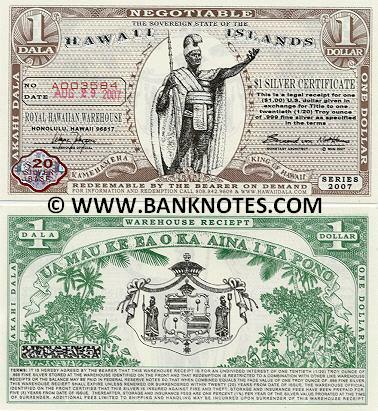 Specially imprinted notes became the only legal tender and had no value outside Hawai’i. The new money consisted of $1, $5, $10 and $20 denominations. 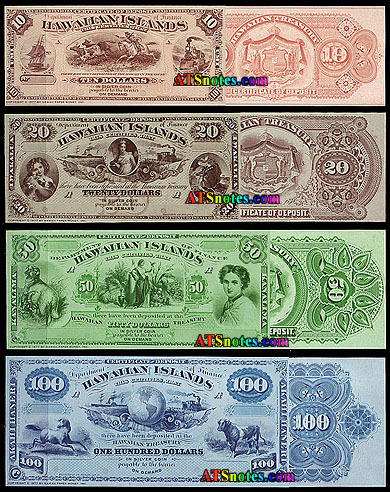 Brown seals and serial numbers replaced the green and blue ones and the word HAWAII appeared twice on the front and once really big across the back. 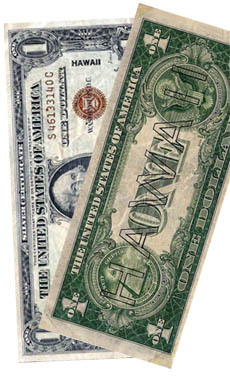 The ‘old’ money would no longer be legal tender in Hawai’i. Due to citizen resistance, it took 27 months to complete the transition and to have the new money in circulation. The government appointed a special committee to dispose of some 200 million dollars of old money. The enormous quantity of notes was hauled to the Aiea Sugar Mill on Oahu and incinerated. Today, old Hawaiian coin and currency is highly valued by collectors around the world. 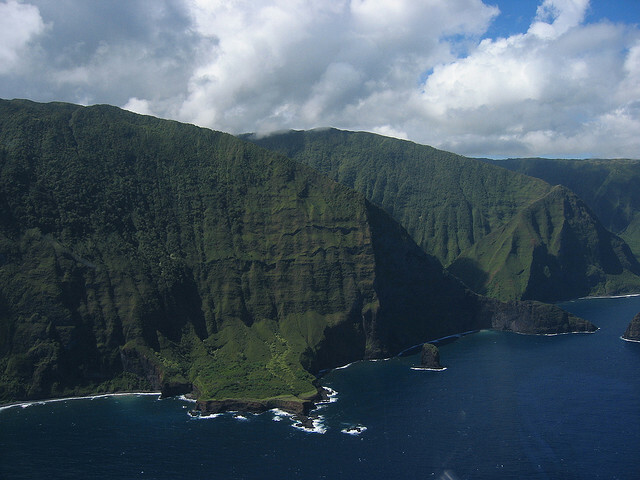 There are few ancient landscapes left in the Hawaiian archipelago that are as untouched as the Kalaupapa peninsula. 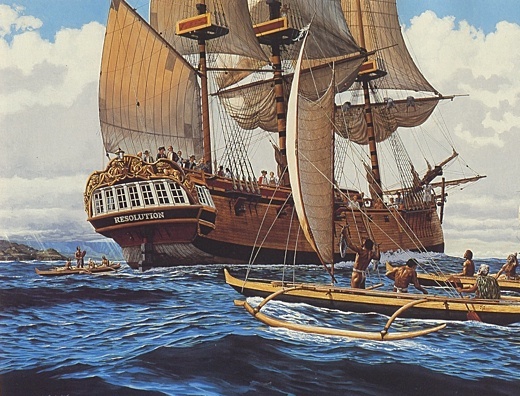 For 900 years Hawaiians lived and thrived on this northern jut of land. Archaeological evidence of their lives and connection with the ‘aina or land, is everywhere, from their house sites to their irrigated taro fields to their stone walls. Historical accounts speak of populations of 1,000 to 2,700 living on the peninsula, in the valleys, and in the villages. A series of epidemics in the 1800s decimated the Hawaiian population and by 1853 only about 140 people lived in the village of Kalaupapa. In 1865, fearing the spread of leprosy, the Kingdom of Hawai’i quarantined lepers to the isolated peninsula. Until 1969 over 8,000 people were sent there. Father Damien de Veuster arrived at the remote settlement on May 10, 1873. Under his leadership, basic laws were enforced, shacks became painted houses, working farms were organized and schools were erected. On October 11, 2009, Father Damien was canonized by Pope Benedict XVI, becoming Hawai’i’s first saint. Born from two volcanoes, the island has a unique geology. Moloka’i boasts the world’s highest sea cliffs, Hawai’i’s longest waterfall, the largest white sand beach in the state, and 24.8 miles of coral reef — the longest in the U.S.
A view of the highest sea cliffs in the world, towering 3,600-3,900 feet in the air. 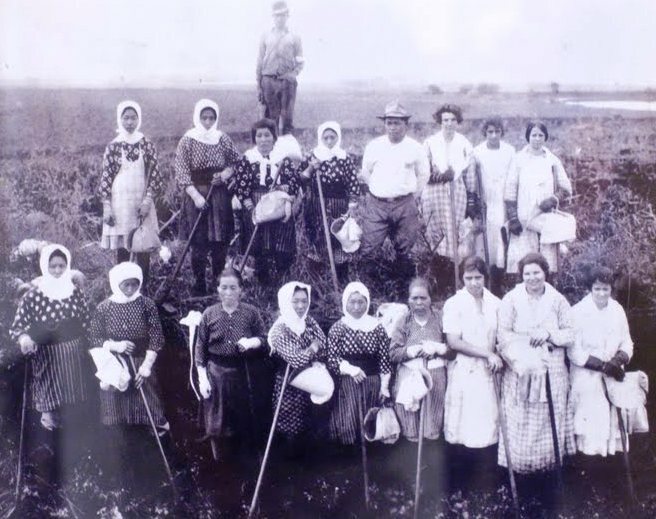 They formed a natural barrier for the Kalaupapa colony of outcast lepers in the 19th century. If you’d like to see more of these sea cliffs they are featured in the movie Jurassic Park III. 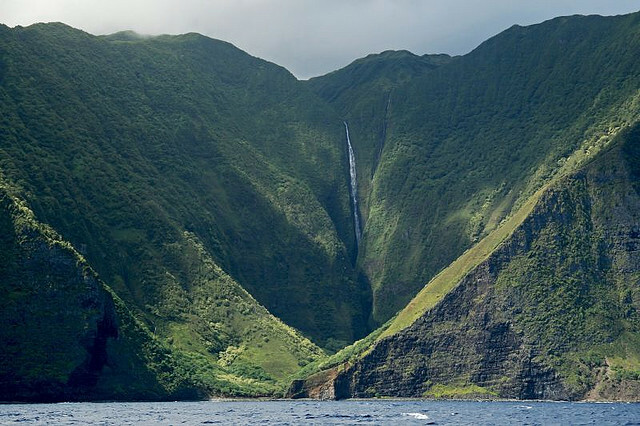 Kahiwa Falls is a tiered waterfall located on the northern shore of Molokai, between Wailau and Papalaua valleys. The waterfall is about 2,165 feet tall, although often only 1,749 feet of its drop are counted as the main fall. The falls have 6 tiers, the highest drop is more than 600 feet. Kahiwa Falls can be observed only from the sea or from air. At strong winds waterfall may get caught and raised upwards. One of the longest and finest beaches in the Hawaiian Islands, Papohaku Beach extends over three miles of coastline and is more than 300 yards wide. 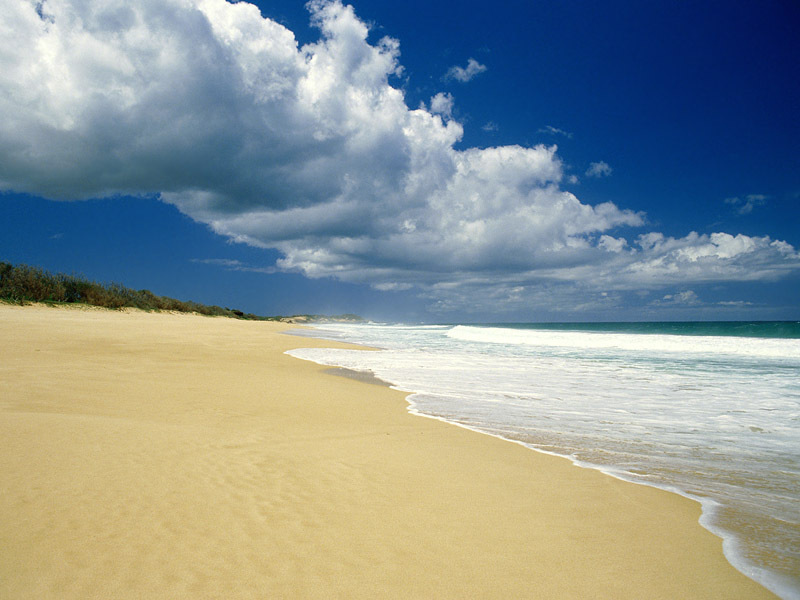 Even though the beach is beautiful, it is often deserted and it is not uncommon to find yourself alone in paradise here. Strong tradewinds coming from the west can whip up the sand along this long beach during windy weather. Pidgin, or Hawaii Creole English as experts call it, began as a form of communication used between non-English speaking immigrants who came to work on the plantations, and the Hawaiian and English speaking residents. Pidgin has been influenced by the many languages of settlers in Hawai’i which included Portuguese, Cantonese (Chinese), Japanese, Filipino and Korean, as well as Spanish, Mexican and Puerto Rican. Pidgin started to be used outside the plantation between ethnic groups in the community, and school children learned pidgin from their classmates. Eventually it replaced their original languages and became the primary verbal communication of most of the people in Hawai’i. 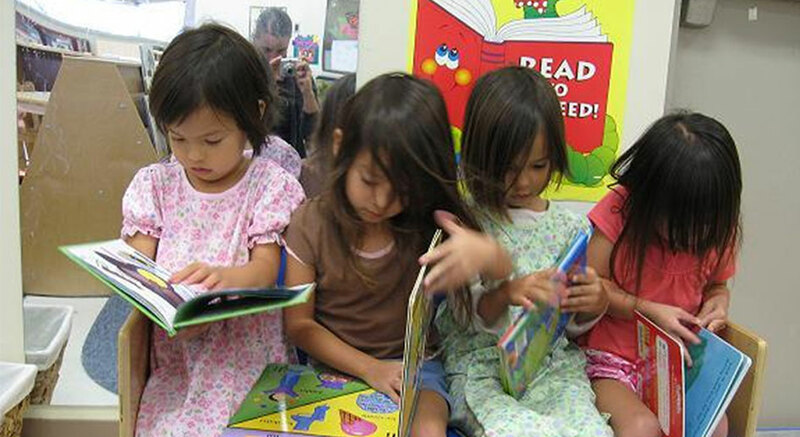 Hawaiian Creole English borrows vocabulary and syntax from Hawaiian. 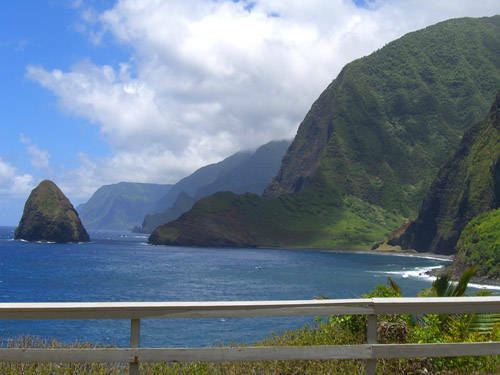 Most place names are retained from Hawaiian, as are some names for plants or animals. For example, tuna fish are often called ahi. Some expressions, such as brah and da kine, have found their way to other places. Syntax often follows that of Hawaiian. Certain words can be dropped if their meaning is implicit. For example, instead of saying “It is hot today, isn’t it?,” a pidgin speaker is likely to say simply “stay hot, ah?” Grammatically, pidgin follows an English translation of the Hawaiian language. In the classroom however there was intolerance of pidgin by Hawai’i’s teachers and administrators as it was considered to be a hindrance to learning standard English. But in the 1970s, linguists studying the varieties of Creole English throughout the world came to consider these dialects to be languages in their own right and advocated their use in the classroom as a means of reaching pidgin-speaking students who could not understand the teachers. “They have a clear advantage in that they can negotiate in different situations,” says Walter Wolfram, a North Carolina State University linguist. In a 2004 study published in the journal Psychology and Aging, researchers determined that bilingual speakers are better able to deal with distractions, and that may help offset age-related declines in mental performance. Believed by Hawaiians to be the greatest life force of all foods. Taro was believed to have been formed by the union of daughter earth and father sky, before man was born, and taro was honored as superior to man. Its traditional Hawaiian name is kalo and its cultivation was associated with the god Kane, procreator and life giver, provider of water and sun. 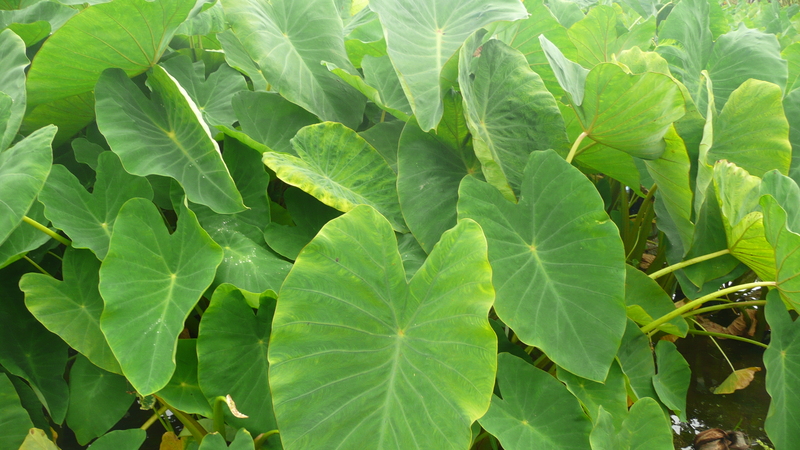 When Captain Cook discovered the Hawaiian Islands in 1778, the native population lived chiefly on taro and sweet potatoes supplemented with things from the sea. 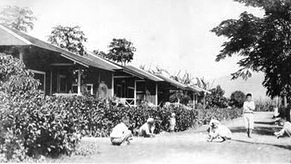 So intensive was its cultivation that there may have been up to 300 cultivars in Hawaii at that time. 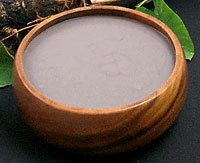 Taro is eaten around the world but only Hawaiians make poi. The bowl of poi was such a sacred part of Hawaiian life that when it was uncovered at the dinner table all conflict ceased. People were not to argue or speak in anger. Low in calories taro is one of the world’s most nutritious foods, often described as a “miracle food.” Typical of leaf vegetables, taro leaves are rich in vitamins and minerals. They are a good source of thiamin, riboflavin, iron, phosphorus, and zinc, and a very good source of vitamin B6, vitamin C, niacin, potassium, copper, and manganese. 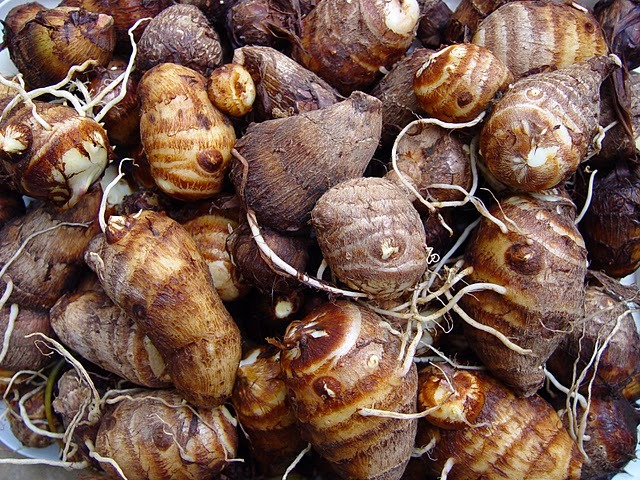 Taro corms are very high in starch, and are a good source of dietary fiber. Compared to potato, taro corm has a higher proportion of protein (1.5-3.0%), calcium, and phosphorus; it has a trace of fat, and is rich in vitamins A and C. Moreover, taro is 98.8% digestible. 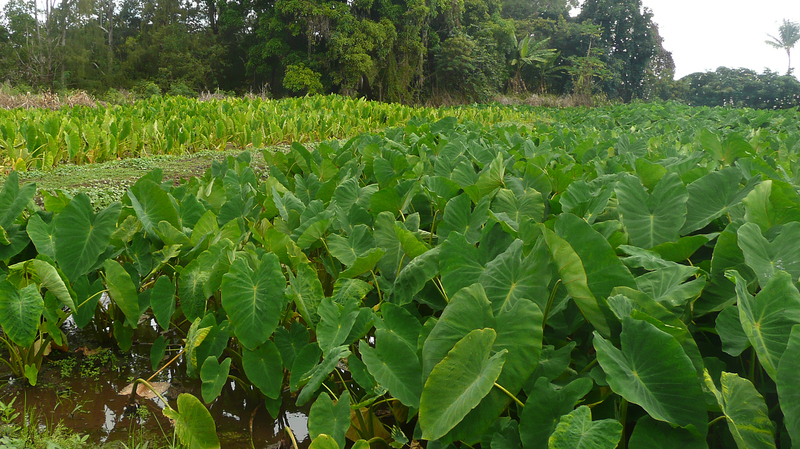 Today taro is the 14th most cultivated crop on earth. About 10% of the world’s population uses taro as a staple in the diet, and for 100 million people this is an important daily food. Maui County produced close to 20% of Hawai`i’s 4.5 million pound crop in 2006. Since 2002 taro acreage has gone from 100 to 55 acres. Production dropped by 185 tons, and agricultural revenue fell by almost 18.5 percent. 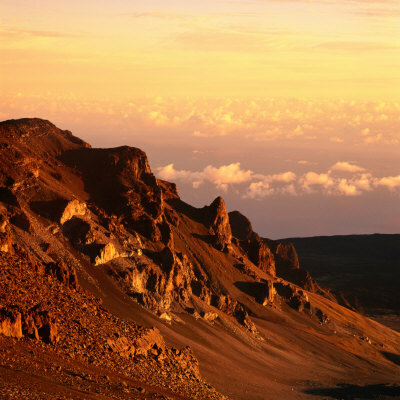 In its prime, Haleakala may have reached a height of 15,000 feet. Pu‘u ‘Ula‘ula is the highest point on Haleakala’s summit, with an elevation of 10,023 feet. But the mountain was once much higher than this. At one time Maui consisted of 2 separate islands. 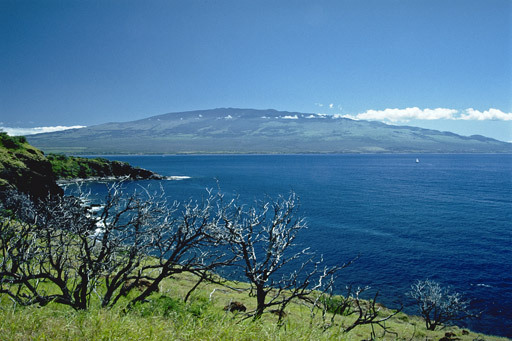 The sea between them was filled with erosion from the two volcanoes, and the fertile Central Maui valley was formed connecting the West and South. 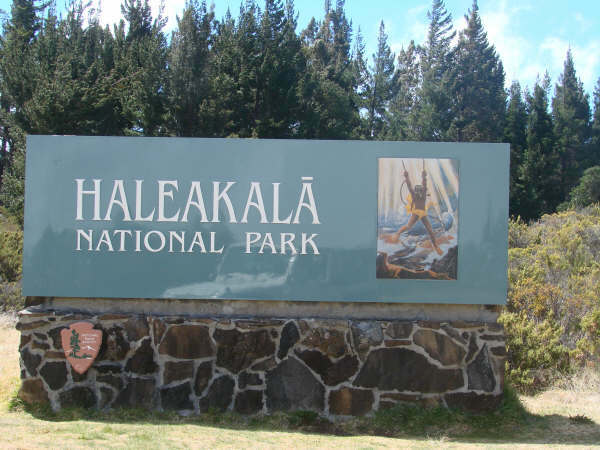 Factors that have contributed to Haleakala’s shrinking include thousands of years of wind and water erosion that began to carve two large river valleys out of the rim, rapid caldera collapse, and slow sinking into the ocean bed. The volcanoes of the Hawaiian chain do not erupt violently like Mt St. Helens, but rather have a long, sustained and relatively gentle eruptive cycle. They form “shield” volcanoes, so-called because they resemble the silhouette of an ancient Greek shield. As with icebergs, these volcanoes show only a small part of their total mass above water, leaving 95% below on an ocean seamount. Haleakala is the 3rd highest point in the Hawaiian islands. It is also the third highest mountain in the world from seamount to top. As the Pacific plate moves northwestward at 10 cm per year, it carries the shield-stage volcano away from its heat source. As a result, the volcano erupts less frequently, and the lava erupted will differ chemically from that produced during the shield stage because of the diminished heat supply. These changes define the character of the third stage, called postshield volcanism. Nearly 200 km from the hot spot, Haleakala volcano is still in its postshield stage of volcanic evolution, and has been active for two million years. 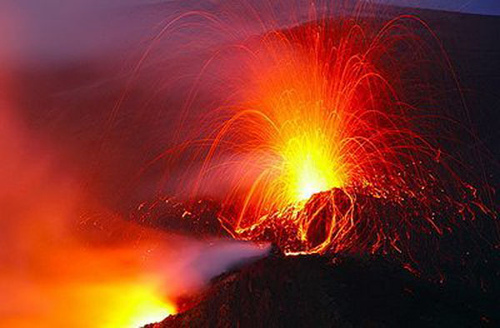 It remains active, having erupted several times in the past 1,000 years. 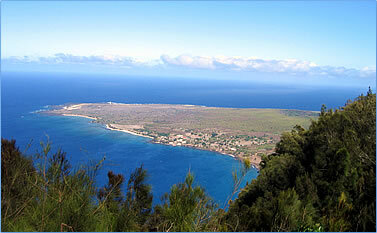 Haleakala’s last eruption was near the southernmost foot of the mountain at La Perouse Bay in the mid-1700s. Postshield lava supply is diminished, but not curtailed completely. Haleakala will erupt again, given the frequency of its past eruptions and long eruptive history. Modern understanding is that the recent, and coming eruptions are the waning efforts of a postshield-stage volcano. 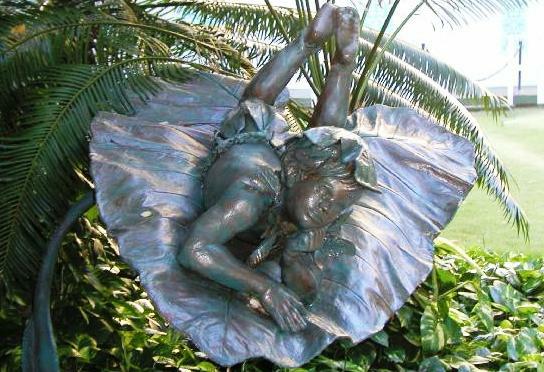 The folklore of many nations around the world includes stories of magical little people. In Hawai`i the mythology of the Menehune is as old as the beginnings of Polynesian history. 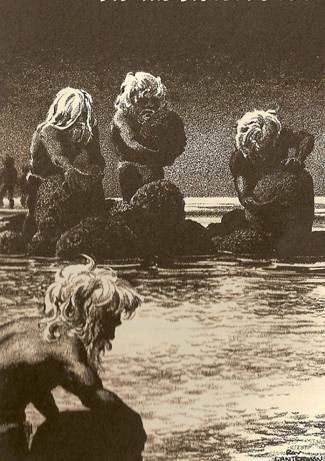 When the first Polynesians arrived in Hawai`i they found dams, fish-ponds, and even heiau (temples), all presumably built by the Menehune who were already there, living in the forests and caves. Working only at night these mischievous little people performed legendary engineering feats. They reputedly built the largest aquaculture reservoir, the Alekoko Fishpond located near Nawiliwili Harbour outside Lihue, Kauai. Built nearly 1,000 years ago, it has been on the National Register of Historic Places since 1973. Ingenious ponds like this were built to catch fish, and this fishpond is one of the finest examples of this type of ancient Hawaiian aquaculture. While archaeologists have never found remains of a distinctively small race of ancient people in Hawai`i, many think the Menehune legend may well have a basis in fact. In 2003, a species of dwarf human was discovered on the Indonesian island of Flores. Homo floresiensis was only about 1 meter in height and fully bipedal. The skull has human-like teeth with a receding forehead and no chin. Fossils have been discovered from 38,000 to 18,000 years ago, though archeological evidence suggests it lived on Flores between at least 95,000 and 13,000 years ago. It used stone tools and fire, and hunted pygmy elephants, Komodo dragons, and the giant rats found on Flores. 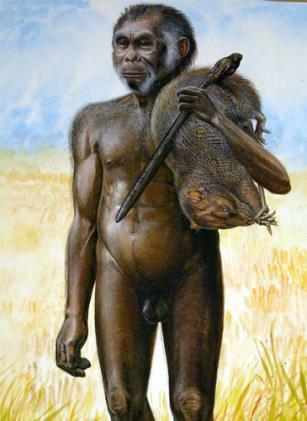 Its discoverers believe that h. floresiensis is a dwarf form of Homo erectus. It is not uncommon for dwarf forms of large mammals to evolve on islands. Modern humans arrived on Flores between 55,000 and 35,000 years ago, and presumably interacted with h. floresiensis. Indonesian folklore tells of small, inarticulate creatures called Ebu Gogo which sounds remarkably suggestive of h. floresiensis, but could easily be coincidence. If h. floresiensis had been found in Ireland, we’d possibly be wondering if they were Leprechauns. 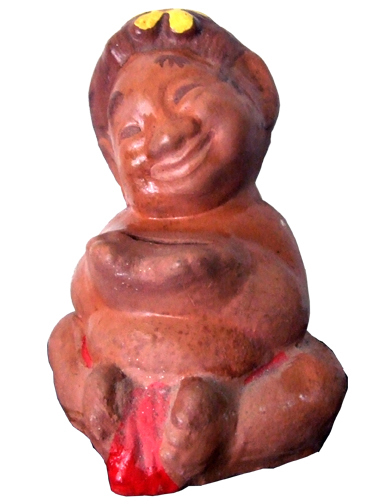 Everyone that lives in Hawaii knows the Menehune had magical powers and created great deeds. ~ The Three Menehune of Ainahou (Maui) by ‘Uncle Charlie’ Charles Kauluwehi Maxwell Sr.
Maui Nui embraces the islands of Kaho'olawe, Lanai, Maui, and Molokai. These posts offer glimpses of this unique place through informative articles about its history, its environment, its communities, and its people.